You quickly learn, at a museum of naval history, that there is art, and then there is marine art, a particular genre of painting that derives, not so much from the love of saltwater in its life- and danger-dealing aspects, but as commissioned expressions of ownership and power over vessels and fleets. At their best, paintings of raging seas, icebergs, and atmospheric effects in ranges of blues and oranges may rise to Turneresque heights, but ship imagery fixes them to a mundane plane. By contrast, Yu-Wen Wu’s practically monotone images of water in various forms, applied to compositions meant to evoke the experience of music, fall squarely on the side of pure art. In Suspended, A Song Cycle, an exhibition of wall-mounted mixed media works on panels, Wu manipulates selected visual effects of water and other fluid environments as elements to make artworks that are visual (that is, silent) musical compositions. The simple pictorial means and their reserved appearance yields surprising depths of meditative expression. The exhibit is on display at the Danforth Museum of Art in Framingham, Massachusetts, and has been extended through November 1st. Wu, who was born in Taiwan and came to the United States at age seven, has taken thousands of photos of ocean waves, recording the time and the latitude and longitude of each. She applies them onto panels, printed on a thin paper that enables her to layer them up without permitting surface incident to interfere, minimizing edges. Sometimes a flattened wrinkle reveals the process of application, where it has been smoothed with a blade under a unifying matte of (presumably) acrylic medium. Creases and scratches on the surface are appropriate to the imagery, and are not displeasing evidence of craft. Technique at its best is puzzling, and we try to figure out the process. Rectangular coordinates organize the surfaces. The photos, cut and butted up against each other, often repeat the same image. Their borders are disguised with the hachure and scratches that you see on photographic reproductions of the late 19th Century, before darkroom techniques and airbrushing, before Photoshop. The waves are made contiguous with brush strokes of gray and transparent whites. A handful of images could expand into an infinite field, but Wu limits that with the size of the panels and by applying perspective. 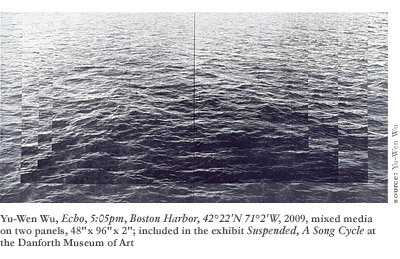 Echo is a large diptych of two squares containing a gray photograph of waves in Boston Harbor. It is immensely soothing to sit in front of, like a peaceful moment in a ferry crossing to a place that’s waiting for you. 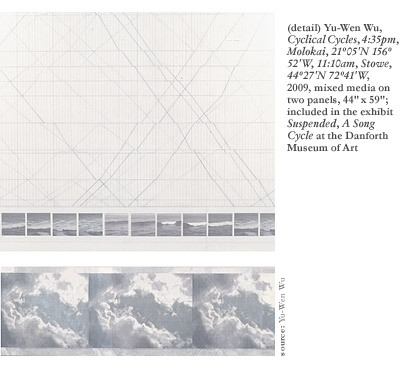 Wu divides the photograph into strips that she pastes back together, preserving the whole image in the center, fragmenting it near the edges. She repeats three strips on left, right, and bottom, expanding the space and the moment. She adjusts the strips vertically or horizontally by different amounts with simple linear perspective. Heraclitus wrote that you can’t step into the same river twice. You may also have heard that you can’t step in the same river even once. You can’t take a photograph of water and preserve a singular form. No matter how short the exposure, it is always flowing; there will always be a degree of blur. This applies to fire, cloud, and the galaxies in deep space. Every photograph is a record, not only of its subject, but of time. Music is traditionally the art of time. 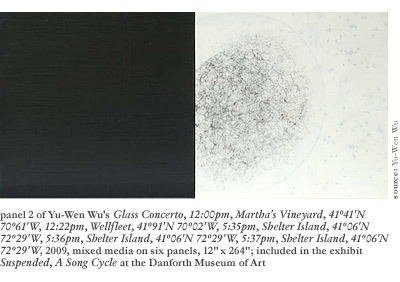 In the six panels of Glass Concerto (a reference to composer Philip Glass), music manuscript paper provides a linear framework for wave and galactic images. Music paper is a sign of music; rows of staves are a visual cue to reading time, an opportunity to serialize, to track. At extreme left, the copied music sheets include the coil-binding perforations that indicate the beginning. It’s hard not to think of the suite of discrete panels as movements, since it is titled Concerto, and the last one is labeled “Coda,” the tail of a composition. But they are art compositions, and not music. The eye is free to stroll back and forth, pause to examine, or jump back, which is never an option for the ear. Four of the six one-foot-tall panels are divided vertically once or a number of times, and photos of regional Atlantic waves appear, repeat, and alternate with or without the horizontal staff lines. The photos are extrapolated into a larger perceptual space by overlapping copies. Wu disguises their edges with paint. 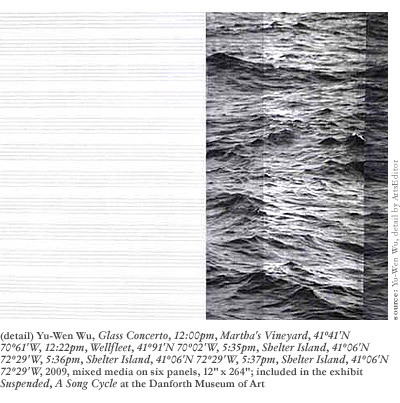 The waves of Glass Concerto were photographed in New York and New England waters. Wu has located them by latitude and longitude, which is to say, where they are relative to fixed points on land. Even when you know exactly where you are, the surface of the wave is moving up and down, currents are shifting, and the molecules themselves are swishing and sliding. Although Wu identifies the waters specifically, water behaves in the same ways under similar conditions everywhere. It’s a universal constant, the material of the globe’s greatest area, the oceans. Dark, ominous, gelid, moody, even Brahmsian, the first panel starts with empty music sheets on the left. On the right, a wave of complex and elegant form has been broken up, reproduced, and recemented. It extends across the panel as in time, the repetitions reinforcing its form as they fix its motion. People love to watch and listen to waves. Whitman sat on Long Island surf beaches to orchestrate his verses. Bach’s great waves of notes recurring and rebuilding are sufficient to themselves; Disney’s “Toccata and Fugue” in Fantasia is self-parodying. Mendelssohn’s Fingal’s Cave builds on waves. Looking at the first wave in Glass Concerto, it is hard not to think of Fingal’s Cave, and the cave itself, where ocean waves crash deep inside a gigantic aperture in an island of basalt columns, called Staffa (“Staves” in Norwegian). You can only reach it in fair weather in a fishing boat serving tourists part-time, but suspended in an Air France jet, you can look into it from 24,000 feet. “Galaxy,” the second movement of Glass Concerto, is a diptych, a very dark square joined to a very light square. Wu has brushed the dark square vertically and horizontally with red-black and blue-black. It sparkles like fresh rock. The outer edges are thickened in a way that suggests a removal of paint along with its application. A horizontal band across the bottom may be a gratuitous allusion to Brice Marden’s gray encaustics. The lighter side has a large round structure which could be an elliptical galaxy seen in negative, or it’s an ovum. The black-and-whiteness of this element distracts from the rest of the panels, arrangements of gray waves and music paper. The black square is a hole in the wall. The coda that concludes it is a photograph of galaxies in deep space, black with elliptical diaphanous colored drops. The black square will remain a challenge in modern art, and one of its problems is cliché. Hard to believe, but standing in front of an Ad Reinhardt black square painting at MoMA, visitors still fume about the decline of painting, even though the colors tinting the black have become easier to perceive after 50 years. From the Book of Dreams refers to the film strip, an archaic variety of slide show on a celluloid scroll. Wave photos from the Aegean Sea appear around, between, and behind cylindrical forms. They are columns of absent information, vertical bands of black blending episodically to green and yellow, curiously unnatural neutered colors, sapped or bleached, neither plant nor mineral, deeper and greener than lichens, less sour than tarnishthat nondescript green you get from adding yellow to black. In their vague, industrial ordinariness, they perform multiple compositional duties. While they derive from artifacts of photographic process, the effect is architectural. The columns provide a sense of presence as well as passage, contrasted with the waters behind and in between them, a manipulation of spatial sensation, an expanse crammed between pillars, at once a feeling of looking out and being inclaustrophobic, or that metal band your dentist clamps around a molar. Cyclical Cycles is a complex framed drawing, a frieze of a discontinuous sequence of Hawaiian crashing waves in a frame, the whole underlined by a long panel of sky photos, clouds changing over time. The drawing is an elongated grid of lines in pencil on the back of a translucent paper. The wave photos, in groups tinted vaguely violet or blue, are also fixed to the back and seen through it, veiled. Wu has drawn diagonal lines across the front surface of the page, interrupting and offsetting them where they meet the horizontal lines. The offsets add an apparent perspective thickness to the piece, but they are more like vectors that intersect bands moving at a different speeds, or faults that enable the mid-oceanic ridges to expand across a spherical surface. They imply an analysis of motion, space, and time, whether artistic or scientific. Artistic license seems to have governed the arrangement of a row of sky pictures on a panel hung beneath the framed image in Cyclical Cycles. One square is set apart from the rest of the row, and the whole of them may or may not be the same width as the drawing inside the frame. Some of the works in the exhibit are on board, with wooden edges. They present a more finished effect than the bright white stretched canvas edges of others. All of the works are the same thickness, which seems neither thick nor thin, but ordinary, ready-to-paint. The third dimension is apparently irrelevant to the individual artworks. It does not distinguish between purely surface or wall object. The imagery requires that the off-white surfaces not wrap around the edge of the panels, but be flat on the surface. However, the flat white fabric edges are almost repellent in their resistance to visual or tactile response. The paintings on boards with white-rubbed wooden edges are more inviting. In the Form of Snow and Spray is a nearly nine-foot-long celebration of water, an especially musical composition. Illuminated snowflakes are blurs of white, like stars in the little galaxy of your backyard at night. Its second panel is a filigree of churning foam, the aftermath of a crashing wave. The finale is a spray of water coming apart in air, like leaping fountain waters, or fireworks, or expanding sound itself. Music used to be divided between abstract and programmatic, as art was divided between representational and abstract. Experiments of the last 50 years have changed dichotomies to polytomies, now that we have art designed not be produced, music written not to be played or heard, and combinations of the many. Yu-Wen Wu’s works are handsomely produced, elegant, thoughtful, and moving. Their combination of simplicity and artful containment of chaos projects an immediate sense of meditative serenity. They are sensually pleasing, and suggest scientific and philosophical truths. The images become something otherallegories of sound or mathematics. While Wu states that they are about suspended time, we’re also suspended in the planet’s fluid elements, bobbing on the surface, surrounded by the air, always wandering in the second and third dimensions, the whole ball of flux whirling in a sequence of orbits in a restless universe.